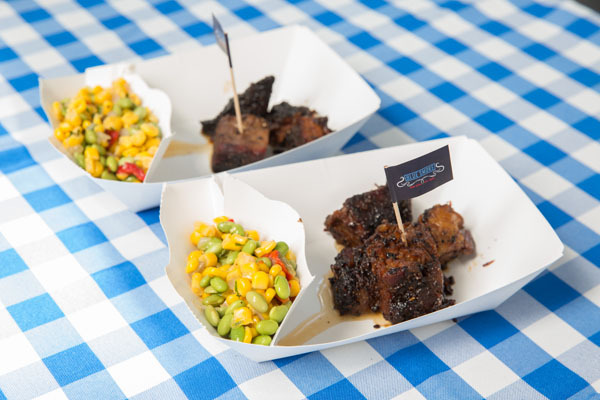 The Big Apple Barbecue Block Party is the nation’s largest culinary and music festival dedicated to the best in barbecue. Celebrating its 15th Anniversary, this beloved weekend-long event welcomes over 130,000 guests annually from across the city, and the country. Enjoy mouthwatering ’cue from the world’s most celebrated Chefs and Pitmasters. Throw in the beer, wine, and great live music – all set against this stunning Manhattan backdrop – and you’ll find yourself at the ultimate summer street party. 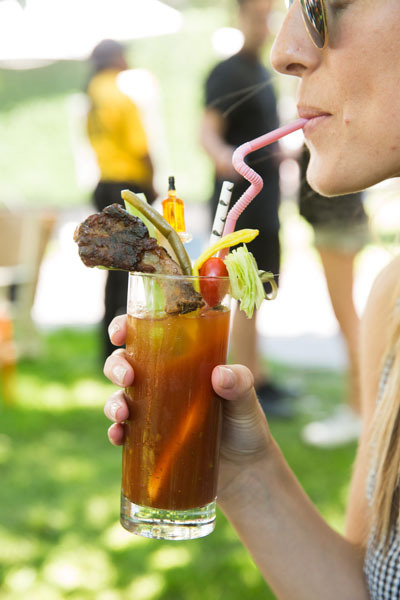 Founded in 2002 by Danny Meyer, Chef Kenny Callaghan, and Mark Maynard-Parisi, the Big Apple Barbecue Block Party exists to bring America’s most destination-worthy barbecue to the heart of New York City. What began as a small, single-street soirée 15 years back, is now a blockbuster annual affair that stretches across a handful of city blocks in, and around, Madison Square Park. For one weekend each June, the city is truly transformed. 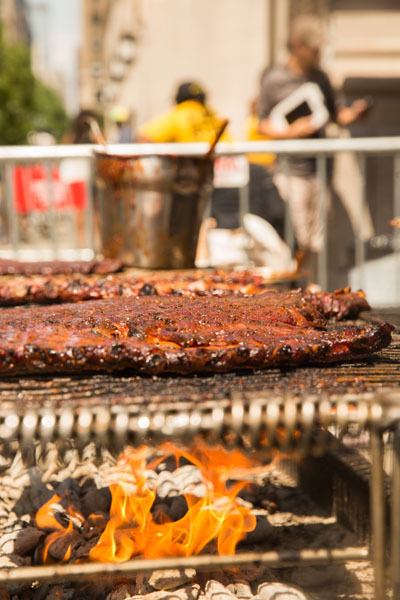 Madison Avenue shuts down as a parade of BBQ rigs descend on the Flatiron – overalls and Stetson hats, galore – where the top Pit Crews set up camp to smoke their award-winning whole hogs, ribs, brisket, and the like through the night, and serve happy hordes of barbecue lovers all day. In addition to all the wonderfully transporting sites, smells, tastes, and sounds, guests can feel good about the event’s charitable mission, with proceeds benefitting the Madison Square Park Conservancy. Since inception, over $1Million has been donated to Madison Square Park Conservancy to support its beautiful gardens, amenities, and world-class art and civic programming. There’s nothing else quite like the Big Apple Barbecue Block Party; if you know, you know. 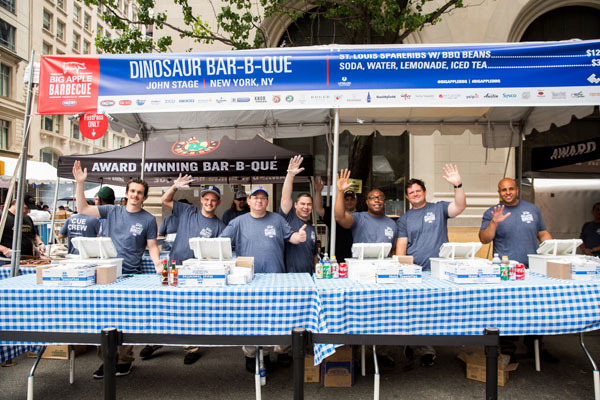 June 2, 2017 New York – Madison Square Park Conservancy is pleased to share final details on the 15th Annual Big Apple Barbecue, one of the nation’s biggest barbecue festivals, taking place June 10 – 11, 2017 from 11 AM – 6 PM. 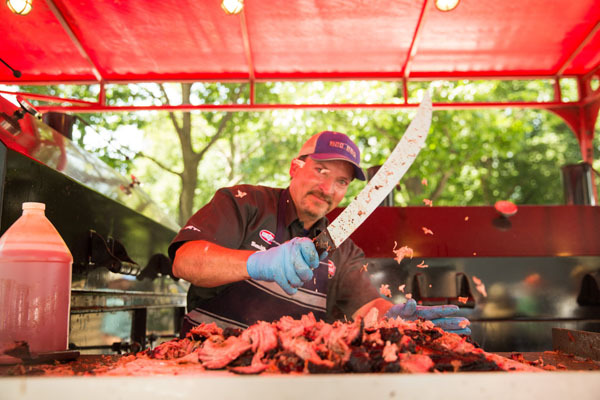 Next weekend the Park will host fifteen legendary pitmasters, each serving up a signature plate of ’cue, along with a series of free live concerts taking place throughout the weekend. 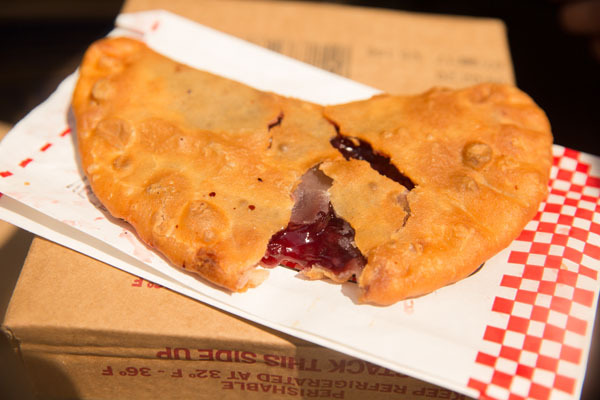 On the sweet side, expect treats from the Original Fried Pie Shop (the sister eatery to Baker’s Ribs out of Texas), triple layer cakes from Mississippi’s Sugaree’s Bakery and milkshakes from F’real. Wash it all down with Brooklyn Brewery beer and wine in one of two Beer Gardens popping up inside the Park, one at the north end and the other in the south – right next to the music stage. Located at the southwest corner of Madison Square Park, the music stage boasts a stellar roster of bands and artists performing throughout the weekend. Brooklyn honky tonk Skinny Dennis will also present DJ sets by Amira Nader (Saturday) and Vinyl Ranch (Sunday). This Brooklyn-based band has found an authentically new way to honor the bedrock of much of today’s music by synthesizing the blues-folk-rock of the past. Since their formation in 2010, Milwaukee-based folk band Dead Horses have crafted a timeless sound, informed as much by early-American prose as by modern Americana. Boston roots rockers the Adam Ezra Group (AEG) are dedicated to creating music with a purpose, devoting their time and proceeds to local charities. Inspired by the musical architecture and language of afrobeat, Antibalas is a collective of musicians whose sound incorporates elements of jazz, funk, dub, improvised music, and traditional drumming from Cuba and West Africa. Austin-based indie rock singer/songwriter and multi-instrumentalist Walker Lukens combines his soulful, emotive tenor with alt-pop songwriting. Lush rock n’ roll with compelling lyrics and a voice to match, Austin’s Emily Wolfe was recently named a “Top 5 Artists to Watch” by NPR. Former front-man of beloved Baltimore band The Bridge, Cris Jacobs mixes elements of blues, country, rock, bluegrass, soul and R&B. With a well-earned reputation for raucous, roots-tinged rock and bluesy reverie, New Jersey natives Southside Johnny & The Asbury Jukes have developed a famously dedicated fan base for their more than 30 albums. 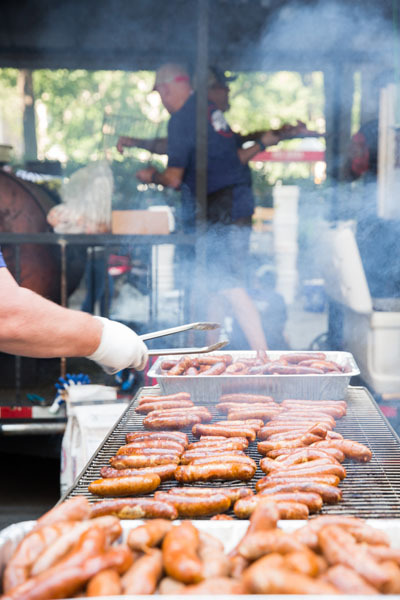 The Big Apple Barbecue is open to the public and free to attend, with food and beverages available for purchase and proceeds benefitting Madison Square Park. For those eager to beat the lines, a FastPass ($150) guarantees exclusive access for two to the express lanes throughout the weekend and includes a $125 value redeemable onsite for food, beverages, and merchandise. For those who really want to go whole hog in support of the Park, the Big Rig VIP Pass ($275) offers a FastPass plus VIP credentials for two to the “Pit” Stop Hospitality Tent and Open Bar for either day of the weekend. A limited number of both passes are available at bigapplebbq.org/tickets. The Big Apple Barbecue Block Party would not be possible without the support of our sponsors, who will be on-site providing activities and programming throughout the weekend. The 2017 Big Apple Barbecue is presented by Kingsford Charcoal, with Rich Products Corporation serving as the official sponsor. Supporting sponsors include 7Up, Bethpage Federal Credit Union, Brooklyn Brewery, Don Julio Tequila, Farm Rich, F’real, GEICO, Guinness, Guitar Center, Knob Creek, McCormick & Company, Natalie’s Orchard Island Juice Company, Saratoga Spring Water Co., Smithfield, SONY, Southern Foodways Alliance, Tabasco, The Roger Hotel, Time Out New York, Tito’s Handmade Vodka, Vito Wood, WFUV, Yelp, and ZICO Coconut Water.